Hide.me is a great service with an easy-to-use app, solid speeds, but it'd be better if we knew who was behind the service. Every VPN claims to be the fastest, or one of the fastest, services on the Internet, but often those claims don’t pan out. Malaysia-based Hide.Me not only claims it’s fast, but has the annual charge to prove it. How did that work out for the company? Let’s take a look. Hide.me with a live connection. When you first open up Hide.me it’s satisfyingly simple. 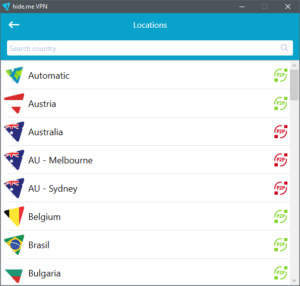 There’s a big Enable VPN button right in the middle of the interface, in the lower-right is a Change button to switch locations, and the lower-left has your current IP address and country. Taking a look at the list of the countries, there are 34 to choose from in a scrolling, searchable list and very easy to scroll through. Hide.me also notes on the far right of each location whether you can use it for P2P file sharing. If you see a green P2P symbol then you’re good to go, if it’s red then you’re not. At this writing, the only red countries were Australia, the United Kingdom, and the United States. In the upper-right corner of the Hide.me app is the Settings icon. Most of the settings are pretty standard stuff such as an internet kill switch and the option to launch the app during startup. One nice option in Hide.me is the VPN protocol fallback configuration under Settings > Protocol > Fallback configuration. 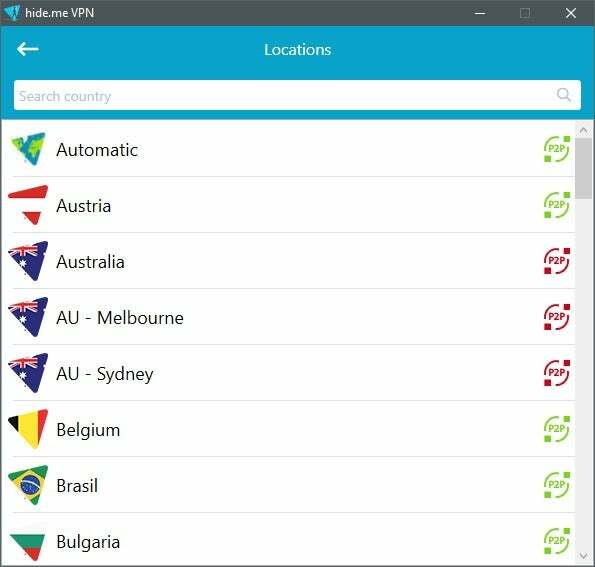 Here you can specify the order that the app tries to connect using the various VPN protocols. 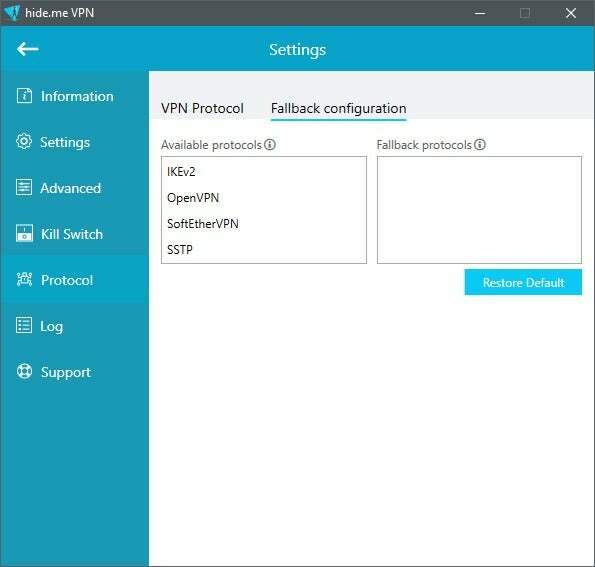 If IKEv2 fails, for example, you can specify that the app tries OpenVPN or SSTP next. 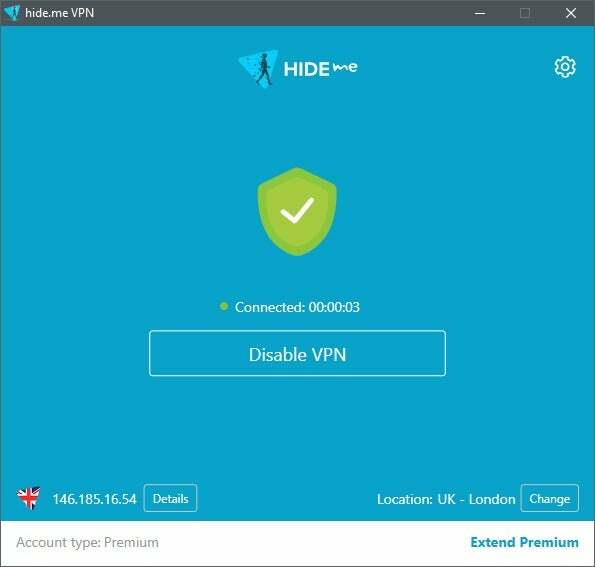 By default on Windows 10, Hide.me users IKEv2, but under Settings > Protocol > VPN protocol you can change the default to OpenVPN, SoftEtherVPN, and SSTP. Hide.me has two pricing tiers. The first is Plus and offers one simultaneous connection and a maximum of 75GB of data transfer per month. The second tier is Premium and offers five simultaneous connections and unlimited data transfer. Plus is priced at $60 per year and Premium is $120. 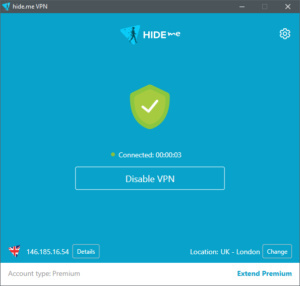 The Premium tier is pretty much the standard service you’d get with any VPN, making Hide.me one of the most expensive VPNs we’ve looked at. Hide.me is available for Windows, Mac, Andrdoid, iOS, and (for all five of you out there still rocking a Lumia) Windows 10 Mobile. Hide.me says all of its more than 150 servers have a minimum of one-gigabit-per-second uplink. The company owns all of its own servers and does not use virtualized servers. Overall, Hide.me was quite fast, scoring nearly 49 percent of the base speed. That’s an above-average score, but doesn’t quite take down the current speed champ, HotSpot Shield. Even if it’s not the fastest, speed is not something you have to worry about with Hide.me. At least when it comes to download speeds. Upload speeds were closer to average compared to other services. When you first sign up for Hide.me, the company only requires an email address, and it says it keeps it in encrypted form on its website to protect your privacy. You can pay for Hide.me with the standard credit cards and PayPal, and a wide variety of cryptocurrencies including Bitcoin, Dash, Ethereum, Litecoin, Monero, and Ripple. The parent company of Hide.me is eVenture Ltd., and the official registered office is Level 2, Lot 19, Lazenda Commercial Centre Phase 3, 87007 Labuan, Federal Territory of Labuan, Malaysia. Hide.me does not publish the leadership or the team behind the company on its site, but a company representative told me the founder and CEO is Sebastian Schaub who, according to his LinkedIn profile at least, is based in Malaysia. That’s a little surprising since most VPNs based in exotic locales are usually there in name only while the team is spread out across the globe.